From our November 1 issue: With sprayable probes, theranostic nanoprobes, and other novel biomarkers at their command, clinical users of MRI, PET, and SPECT may image more incisively. Researchers are developing a host of new uses for molecular imaging techniques—including magnetic resonance imaging (MRI), positron emission tomography (PET), and single photon emission computed tomography (SPECT)—that are already commonly used in patient care. Once these techniques have picked up new capabilities in the laboratory, they will return to the clinic, where they will likely transform the diagnosis and treatment of cancer and other diseases. Molecular imaging was an important component of a “co-clinical” trial of a potential therapeutic for lung cancer that was performed by Dr. Kung’s group. A co-clinical trial involves running an animal study in parallel with a human clinical trial. The animal study generates new data that can then be used to improve subsequent clinical trials. Using this model to examine the effectiveness of the MEK inhibitor selumetinib on lung cancer caused by KRAS (Kirsten rat sarcoma viral oncogene homolog) gene mutations, Dr. Kung and colleagues identified genetic determinants that likely modify how different groups of patients respond to the drug. They also found that PET imaging could be used as an early indicator of drug response. When surgeons remove tumors from cancer patients, they often have difficulty discriminating between cancerous and normal tissue. Soon, “activatable” optical imaging probes may help solve this problem. Hisataka Kobayashi, M.D., Ph.D., chief scientist of the molecular imaging program at the National Cancer Institute, and his group are developing an imaging probe that can be sprayed directly onto a surgical site. The gGlu-HMRG probe is smaller, less toxic, and less expensive than more specific antibody-based imaging probes. Additionally, because it is sprayed directly onto the surgical site, it can be reapplied in the middle of the procedure to ensure that all cancerous tissue is removed. Dr. Kobayashi’s group has performed toxicity studies on small animals and is now testing the spray probe on tumor samples from patients. Dr. Kobayashi is also developing antibody-based activatable photoimmunotherapy probes that can be used to kill cancer cells. These probes contain a monoclonal antibody that binds to a protein that is overexpressed in cancer cells—such as HER2 in breast cancer or PSMA in prostate cancer. The antibody is coupled to a photosensitizer molecule that disrupts cellular membranes and causes cell necrosis when exposed to near-infrared light. The goal is to give a patient a very small amount of a potential drug that has been labeled with a radioactive marker. A doctor can then use a standard imaging technique, such as PET, to see whether the drug is binding to its molecular target in that patient. If it is, a full dose of the drug will be administered to the patient; if it is not, the treatment is unlikely to be effective. According to Dr. Acton, various companies—including Johnson & Johnson—are working to develop tracers that wash out faster. Such tracers could rely on shorter half-life isotopes that would give a lower radiation dose to the patient. Visceral amyloidosis is a fatal disease characterized by the accumulation of fibrillar protein aggregates (amyloid) in the heart, kidneys, pancreas, and other visceral organs. As of now, clinicians in the United States have no way to obtain whole-body images of amyloid deposits in these patients. “We need to develop a way to provide noninvasive imaging to these patients because it could help doctors provide accurate prognoses and monitor therapeutic responses, and it could give the patient a better view of the extent of their disease,” says Jonathan Wall, Ph.D., director of the Preclinical and Diagnostic Molecular Imaging Laboratory at the University of Tennessee Graduate School of Medicine. Amyloid deposits contain a special form of heparan sulfate proteoglycan that is highly charged. Dr. Wall and his group took advantage of this property to develop a small synthetic heparan-binding peptide called p5+14 that can be radiolabeled with F-18, I-124, Tc-99m, and I-123 for PET or SPECT imaging. Dr. Wall and colleagues are currently researching whether p5+14 can be used to monitor disease progression in other diseases associated with amyloid deposits—such as type 2 diabetes and cerebral amyloid angiopathy in Alzheimer’s disease—and are exploring developing this molecule into a therapeutic since it has such high affinity for amyloid. At the University of Tennessee, researchers developed p5+14, a small synthetic heparan-binding peptide that can be radiolabeled for PET or SPECT imaging. This imaging agent, which binds to a heparan sulfate proteoglycan found in amyloid deposits, is being investigated as a way to track disease progression in amyloid diseases. Shown here is the predicted secondary structure of p5+14. 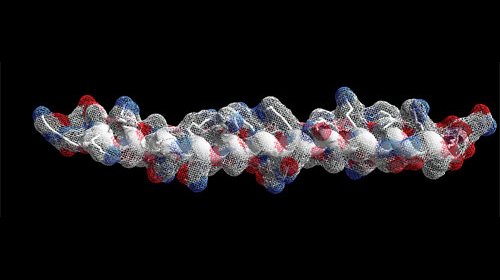 The peptide is alpha helical with all the charged lysine residues on one face of the helix. “A ‘theranostic’ probe combines imaging with a therapy component,” says Anna Moore, Ph.D., associate professor of radiology at Harvard Medical School. Dr. Moore’s group has designed multiple oligonucleotide theranostic nanoprobes to attack cancerous cells, including an siRNA probe that targets the anti-apoptotic gene survivin and a probe that inhibits microRNA10b, a known regulator of cancer cell migration and invasion. Dr. Moore specifically designed her nanoprobes to be modular and adaptable: “We used iron oxide nanoparticles…They are used as contrast agents for magnetic resonance imaging. [The] dextran coating can be modified chemically to conjugate various compounds, and those compounds could be other imaging reporters such as fluorescent dyes for near-infrared imaging. “It could be radionucleotides to combine magnetic resonance imaging and PET imaging. It could be a drug.” According to Dr. Moore, nanoprobes naturally enter the leaky vasculature found in most tumors, but they can also be attached to a targeting peptide that will bind to specific tumor cells. The microRNA10b inhibitor probe looks quite promising in mouse models—it both prevents and also destroys lymph node metastasis in mice that have been injected with primary tumors. Dr. Moore next hopes to see if combining this probe with low-dose doxorubicin could be a viable treatment for human cancers. Time for a Cell Culture Tune-Up or Overhaul?